If there's one constant about AMS Manufacturing, the brains behind that 1,700-hp Nissan GT-R, it's that they want to make everything go faster. Take a stroll through our archives and you'll see. That same mentality applies outside the factory as well. AMS, in business since 2001, is tucked away in West Chicago, about 45 minutes away from Chicago. (Yes, west of.) It's a straight shot along Route 64, which takes you from downtown into the suburbs and a little out in the sticks. Like many aftermarket manufacturers, you can tell immediately which building is theirs by the cars parked outside. 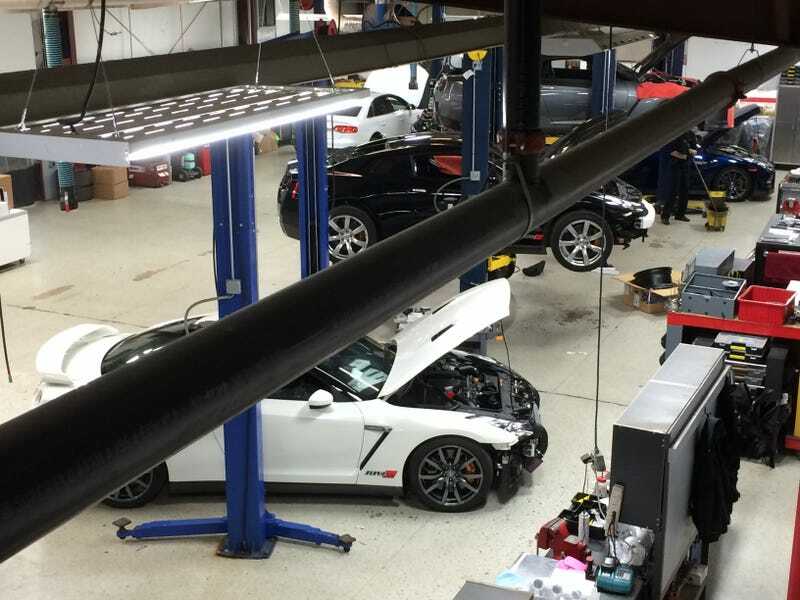 There's more than a million dollars' worth of GT-Rs out front, with engineers bringing other models in and out regularly. If not, there it is. Toman regularly drives it to AMS headquarters and tinkers with it there. He started by swapping in a 6.0L LQ4 V8. It currently gets out 1,000hp, "but could go faster," he says. Then Toman added a custom camshaft from Speed, Inc. (also based in the Chicago suburbs), GM truck coils, a modified oil pan, a custom fuel system (with an AMS surge tank), custom turbo kit, exhaust and a drag-capable transmission from Andy's Performance Transmissions. There's a casket in the back — empty, thankfully. The paint job was done by a friend. It doesn't slow down it's 0-60 time (2.24 seconds), though. There are about 50 other employees at AMS, including a set of twins (one is an engineer, the other catalogs the thousands of parts produced over the years), who make the magic happen. Most of the additional go-fast parts are made in-house, a lesson learned from AMS' earlier beginnings using outside suppliers. "The second you rely on anyone in this industry, they let you down," my tour guide says. If you happen to be around Chicagoland, you can see AMS testing in action at the Autobahn Country Club in Joliet. It takes about 48 hours to retune a stock GT-R into an Alpha 7, which gets out 600 hp. If you want an 1,800-hp Alpha 16, it takes about six weeks, because of the extra manpower and skill needed to work all the parts in. Most times it's an "even trade," with AMS using engine blocks ordered directly from Nissan. The GT-R has been AMS' bread-and-butter for the past few years, but they know that Nissan won't make it forever, so they're adding some new projects. They'll always be in the business of adding more and more to stock builds — "anything that's turbocharged right out the box" my tour guide tells me — but there are some new projects they're particularly fond of. In the garage behind the front office is a pair of Audis — an S4 and an S6. The mission for both of them is the same, and that's to make them go faster (like they're doing with the R8 up above). But here's the thing, AMS says: The engineering on both S models is so tight, it's hard to reconfigure some of the parts or add any more in. Say you want to make the intake manifold lighter, which is one of the goals here. That would mean fitting those tubes in such a way that it won't affect the rest of the engine architecture. Sometimes even the smallest parts — some are the width of a human hair — can muck things up. Because of this, AMS has invested in upgrading its CAD software and purchased a 3D printer. Each block is scanned, and individual parts are 3D-printed, with some printed parts being tested in the engine itself to see if it's the right fit. When they do get the right fit, it's torture-tested to hell and back, with some parts undergoing a 140,000-cycle heat test or superheated to the equivalent of 20 years of use. Getting an engine down pat can take up to eight months. Finally, I get a chance to go behind the wheel of one of AMS' products. Not one of the GT-Rs, unfortunately; they're working on getting one to get up to 2,000hp, maybe more, but can't let us civilians have some fun until it's done. No worries, since I got an adequate substitute: A tuned E63 AMG. AMS wants to make sure the driving dynamics between a stock order and an aftermarket job are as close as possible, so no clunky upshifting and whatnot. So when I took the E63 up to 120 mph in less than five seconds, I could tell. So how much horsepower is too much horsepower? As far as I can tell, there's no such thing.